Water damage companies often have to work in some grueling circumstances, but their efforts are essential to restoring the home to a healthy state. Floods, sewage backflows, leaky plumbing, or roofing and burst pipes can all cause a massive headache for a homeowner, and they need a professional who is skilled and honest. This is easier said than done as the industry lags behind in terms of oversight. However, there are some simple checks that a homeowner can use to determine whether or not they’re dealing with a reputable business. What are the signs of reputable water damage companies? Businesses that perform at a high level have little to hide, so they should be easy to contact and have an established website. As disaster can strike at any time, restoration technicians have to be on call around the clock. Reputable businesses will be available 24 hours a day most days, so the homeowner doesn’t have to wait. The critical period for preventing additional damage is 48 hours. After 48 hours, contaminated fluid will ruin many materials it soaks through, though some organic materials will deteriorate at a faster rate. It’s common for technicians to need to remove drywall, carpeting, baseboards, and casings, but many textiles are salvageable if the technicians respond quickly and the water causing the damage was not sewage. If a company can dispatch technicians to the home right away and provide a detailed estimate of the process, this is a good sign. It takes a variety of skills to restore the home to a pre-loss state, which means the firm will have to maintain a highly skilled and well-trained group of professionals. If a company doesn’t offer all of the services needed to completely restore the home, find one that can. For example, if a firm can't remove mold or other microbial threats, your family may be at a major health risk, even after everything is dried and put back to normal. In general, homeowners should only consider water damage companies that have attained certification through a respected training organization. For restoration professionals, this is the Institute of Inspection, Cleaning and Restoration Certification (IICRC). IICRC-approved schools have trained up restoration professionals for years, and its classes cover a range of topics pertinent to restoration technicians. This includes the theory of water damage, how it affects the home, what materials are at risk, how to remove excess moisture from the building, how to perform structural drying properly, how to inspect and remove pathogens, and how to save sensitive materials like wooden floors. 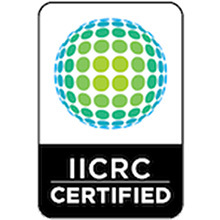 Attaining certification through the IICRC requires hard work and an ongoing commitment to the field, as registrants must earn continuing education credits annually. Homeowners can rest assured that if they are dealing with a certified crew, they are dealing with some of the best in the business. The scope of damage water causes to a structure is greatly underestimated. Other than standing water, stains are a sure sign of a possible water damage problem. Know what to look for to prevent mold growth and long term damage that can affect the safety of your home and health. Any sign of water damage, no matter how insignificant you may think should be taken care of immediately. Floors: Discolored grout, stains or water marks, warped, soft or spongy flooring materials are all signs of possible water damage. · Wood floors Dark or discolored spots could be a sign of mold. CUPPING – the board dips in the center and the edges are raised. Cupping can be caused by spills that are not mopped up right away or high humidity. CROWNING is when the center of the board raises up. It is also caused by excessive moisture. With crowing the top of the board has absorbed more moisture than the bottom, and is usually the result of faulty plumbing or appliances. BUCKLING is the result of the boards pulling away from the subfloor. Wood flooring and subfloors absorb water which causes swelling and buckling. It may be hard to detect the damage if the sub-flooring is covered with carpet. · Tile Floors: Loose tiles or deteriorating grout. If a few tiles have become debonded the entire sub-floor could be ruined. The kitchen and bath are the high risk areas of the home for water damaged floors. In the kitchen pay attention to the flooring around the dishwasher and refrigerator. These appliances have a water supply line and drain line that is subject to leaks. In the bathroom the flooring around the tub and shower are at high risk due to day-to-day exposure to water. Children splashing while bathing, dripping water getting out of shower, cracks in tile or grout all contribute to water damage. Examine the floor around the toilet looking for any discoloration, warping or decay. If the toilet is on a second floor and the seal has been leaking look for signs on the ceiling under the bathroom. Stains, warping, cracks or drip marks may indicate a leak. · Windows/doors: If you notice splintering wood or wood that looks like it’s been chewed up, blistering or peeking paint, the drywall around the frame is swelling or cracking can be due to water damage. Water damage may be harder to identify if you have aluminum, steel or vinyl window and door frames. Usually set into wood framing, if the doors and windows have become difficult to operate, or the drywall shows signs of cracking, swelling or soft spots, paint is blistering or flaking, or ants (they are attracted to moisture) may be due to water. The flooring inside the doorway may also show signs of water damage (see floors). · Ceiling: Discoloration, sagging, bubbling/peeling paint, a rust on metal fixtures (lights, fans etc) indicate water damage. · Cabinets: Warping, signs of rot, delamination, finish is bubbling, staining and change of color. · Drywall: Discoloration, stains, swelling or bowing, a chalky texture, soft areas, crumbling, peeling paint, drywall tape giving way are all indications of water damage. · Caulking: Caulking that has loosened and pulled away from surface, discolored, or shows signs of mildew may be the result of water damage.